I’m in love with GoodReads.com. It’s basically a social network for readers, which sounds a little dorky, but is a great way to bookmark what you want to read, rate what you’ve already read and connect with fellow reading enthusiasts for book recommendations. It also let me easily keep track of the books I read last year – I managed to get through 12. Not bad, averaging one per month. 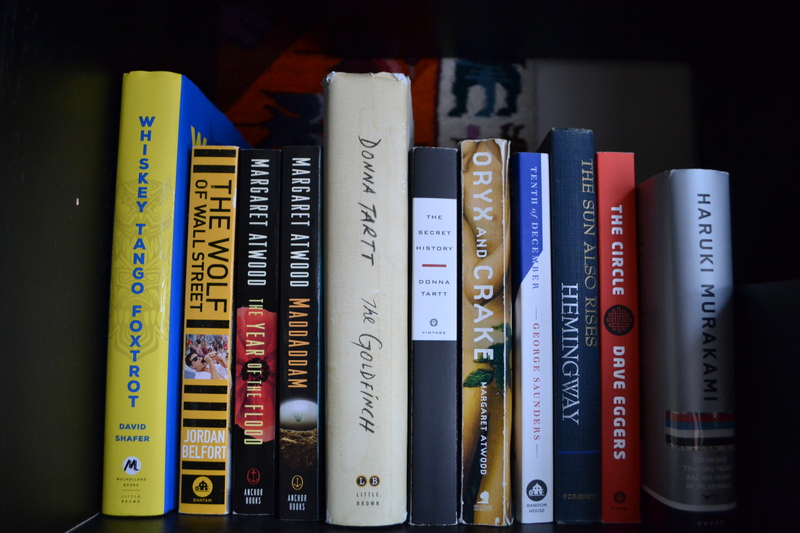 Here’s a recap of what I read in 2014. I started off the year reading this book ahead of the movie coming out. It was certainly an entertaining read, and the book might be even more explicit than the movie. I didn’t know this one was being made into a movie when I read it. All I knew was that it had been sitting on my office-mate’s desk for awhile, so as I was headed for a short business trip, I asked to borrow it for some in-flight reading. I’ve heard the book and movie can be somewhat polarizing, but I loved it. The way the book gets you so invested in the first half of the story, confuses you and then totally does a 180 on you is something that you rarely get in a story. I read a brief synopsis of this true story and was eager to read it. It’s about a journalist who gets to know a con artist claiming to be a Rockefeller, and the story of their friendship as the impostor gets caught. It was a quick read, and perhaps not quite as dramatic as I had hoped for, but it was interesting that this journalist just happened to cross paths with this character and have the chance to write this book. Also, this was a Lifetime movie staring “Will” from Will & Grace, in case that jogs your memory. This was one of my favorite books I read in 2014, and maybe ever. It got a lot of hype and controversy around if it deserved all the recognition it deserved, but I loved it. The plot was sometimes a little ridiculous, but this is a book that really made an impact on me. I became so attached to the main character and his life, and I got emotional throughout. I don’t know if this can be classified as fine literature, but I’d certainly consider it one of the top novels of the year. I enjoyed Donna Tartt’s The Goldfinch so much, I was desperate to read anything else she had written. Luckily, there’s The Secret History. It wasn’t quite as captivating as The Goldfinch, but it was an engaging story about a group of tight-knit college kids and a deadly secret. Margaret Atwood has been one of my favorite authors ever since I read The Blind Assassin (one of my favorite books ever). I wasn’t sure what this book would be about or if it might be too science-fictioney for me, but I got totally sucked into the first part of the MaddAddam trilogy). It’s about a post-apocalyptic world, and follows the story of three people and their lives leading up to a world-altering moment. What makes it such a good book is the characters, how their stories intersect and how they’re involved in the great flood. I think it was around the time I started reading this book that I realized I’m on the verge of becoming a full-fledged conspiracy theorist. For some reason, 2014 was the year of reading books and articles about how big corporations and greedy people are driving the world to ruin. This is one of those book, about an increasingly-power tech corporation taking over peoples’ data and using it to re-establish the world order. Conspiracy theories aside, I did find it to be an interesting book and a good read. Haruki Murakami is another one of my favorite authors, and I was ecstatic to hear he had a new book coming out in 2014. And as someone who loves physical books, this is a great one. It’s small and compact and fun to hold and convenient to carry around. And of course, interesting to read! As always, Murakami always knows how to tell a great, unique story. Not many authors can rival his imagination. And while this isn’t my favorite Murakami book, it was a very solid read. Here, I returned to the MaddAddam trilogy to read book two. Again, the characters just embed themselves into you as you read this engaging and sometimes heart-breaking account of their lives. This is where we learn the greater effects of what the three characters in book one start. Book two might be my favorite of the trilogy, just because you really get to know the entire cast and it delves deeper into a greater span of time in this dark version of the future. I couldn’t wait to finish Atwood’s trilogy. Book three was a satisfying conclusion to the story. Everything from book one and book two came together and became one story. Plus, there was a romantic plot that I hadn’t even realized I was waiting for until it happened. Although the trilogy has a science fiction tone to it, it really is a great story above all, with a message. This is when I accepted that I can’t stop reading conspiracy theory plots. After Whiskey Tango Foxtrot and the MaddAddam trilogy, I was ready for another compelling novel about a big evil corporation taking over the world. I really wanted to like The Circle. I really enjoyed Dave Eggers’ novel A Heartbreaking Work of Staggering Genius and the concept behind The Circle sounds intriguing. It’s basically about a Google-like company whose technology becomes increasingly embedded in peoples’ lives. I will say this – it’s scary how much of the “new” technology in the book already exists today or has come out since the book was published in 2013. However, I found the actual writing to be pretty mediocre. I was pretty much annoyed by nearly every character in the book, especially the protagonist. However, I will say that it makes you think a bit more about how transparent you want to be on technology and the implications of that decision. I had to take a break from the conspiracy craziness, so I scooped up this Ernest Hemingway novel when I saw it in a used bookstore. (Side note: I pretty much exclusively buy my books from used bookstores these days. Ravenswood Used Books is awesome for its atmosphere of floor-to-ceiling shelves full of books while Shake Rattle & Read is my go to for the newest books at a much more attractive price, as well as lots of classics.) Somewhat surprisingly, I’ve never read a Hemingway book before. The other year, I did read The Paris Wife, which is an excellent work of historical fiction about Hemingway and his first wife, and that re-sparked my interest in him as an author. (I was of course intrigued when I read about him and his six-toed cats many years ago.) The Sun Also Rises is set mostly in Spain around the bull fights, which is an interesting topic in itself, but what I enjoyed most was the roaring 20s vibe of the book. It seems to give a really clear view of what a certain set of people lived like in those days. And deciphering the language and slang of the day was a fun challenge. I’m looking forward to 2015 as another year of great reads! Hopefully I can beat last year’s average and perhaps make it to 15 new books read in 2015.